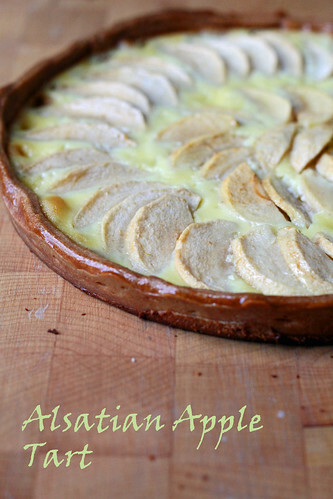 This Alstatian Apple Tart made me think of cooking school. We made one very similar during my first few weeks at the FCI. That was years ago, but I liked it then and I like it now, too. In fact, it was much nicer to make it at home, where the only judge is yours truly and I don’t have to wear an annoyingly scratchy neckerchief or wobbly paper toque. It’s a pretty easy tart to make…a sweet dough, apple slices and a little custard. I lightened up the custard in the book by only using one egg (and skipping the extra yolk), using a combo of milk and cream (rather than all cream) and skimping on the sugar. My CSA is done for the year, but I’m still trying to use up the apples we got in the final couple pick-ups. I have no idea what kind they are, but they are little, have red skins and were just fine in here. Because this tart has the custard built-in, you don’t even need ice cream! For the recipe, see Baking: From My Home to Yours by Dorie Greenspan or read Jessica’s blog, cookbookhabit. And see Lethally Delicious for Bittersweet Brownies, this week’s other recipe (which I unfortunately din’t get a chance to make this week). Don’t forget to check out the TWD Blogroll! Looks amazing – that’s some crust! I will try the lightened-up version next. Thanks so much for baking along with me! Beautiful tart. Thanks for the tip on one egg and different milk mixture. I am making only a small one and didn’t want to use too many eggs. What a lovely tart – I enhjoyed this one too. love the layered apples peeking through!